• The Phoenix Rises - in this new video interview, Shangkuang Ling-fung recalls how she made her acting debut in Dragon Inn and discusses King Hu's vision of the film and working methods. The interview was conducted exclusively for Criterion in 2018. In English, not subtitled. (11 min, 1080p). 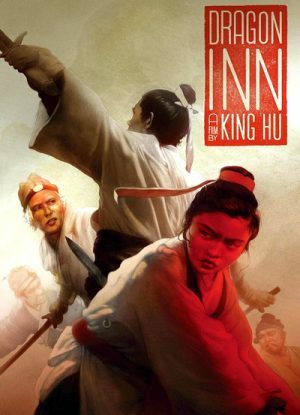 • Making History - in this featurette, actor Shih Chun explains how the character he played in Dragon Inn launched his career, and discusses his work with dierctor King Hu during the shooting of the film. The featurette was produced for Criterion in 2016. In Mandarin, with printed English subtitles. (11 min, 1080p). • Art in Action - in this new featurette, Grady Hendrix, author and cofounder of the New York Asian Film Festival, discusses the groundbreaking martial art style that the films of King Hu promoted and legitimized as well as the profound impact that they had on countless directors and their own styles over the years. Also included is an excellent analysis of a key scene from Dragon Inn. The featurette was produced for Criterion in 2018. In English, not subtitled. (26 min, 1080p). • Premiere Newsreel - archival footage from the film's premiere in Taipei, Taiwan. In Mandarin, with optional English subtitles. (2 min). • Trailer - restored trailer for Dragon Inn. In Mandarin, with printed English subtitles. (2 min, 1080p).